You will examine research that connects improved social presence with improved student interactions, learner satisfaction, and learning. You will also dive into a supportive, experimental learning environment as you try out emerging technologies that will infuse your students’ learning with your warm presence. 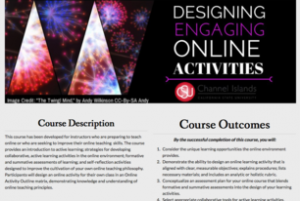 This course provides skills to develop an engaging, student-centered, online course. 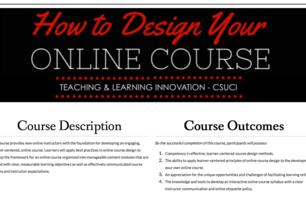 You will master backwards course design and create the framework for an online course with manageable content modules that are aligned with clear, measurable learning objectives, as well as effectively communicated course policies and instructor expectations. This course provides an introduction to active learning; strategies for developing collaborative, active learning activities in the online environment; formative and summative assessments of learning; and self-reflection activities designed to improve the cultivation of your own online teaching philosophy.